Home » Progressive web apps, the future of the mobile web – why you shouldn’t be to late! Everyone has heard about it, but very few really know what to do with it. In less than 5 minutes you won’t be one of these people anymore! 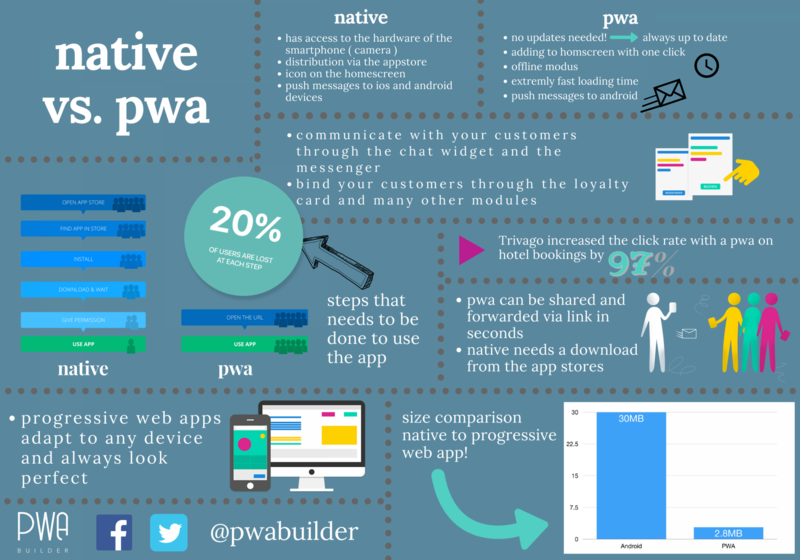 You will learn what progressive web apps (pwa’s) are, why they will become so important in the future and why you should not miss to develop your own with a pwa builder in only a few steps and for very little money. What are progressive web apps and what is different to native apps? A progressive web app is an application that makes it possible to display browser content like in an native app. However, this is a mobile website that adapts to any device and feels and looks like a native app. Native apps are developed and deployed exclusively for a specific operating system – Android or iOS. The well-known App Stores serve as a sales platform for these apps. Users use these to access the apps and download them to their smartphones. Creating, maintaining and developing native apps is very expensive and time consuming. Progressive Web Apps can be accessed via the Internet browser and the user experiences the typical handling of a native app. They can also be used in offline mode, since their contents are stored in the cache of the device and thus all important elements are also loaded offline. So far, however, only Android supports all app functions, e.g. sending push messages to android. As a mobile website the PWA Google indexing is possible, through Service Workers the app is always up to date. The progressive web app also benefits from fast loading time and uncomplicated storage on the home screen. The mobile app can be easily shared by a messenger with friends and is very secure thanks to SSL encryption. Technology is evolving faster and faster nowadays, but those who are even faster are usually the users. Your users and potential customers! As it was okay a few years ago to have an average website, which contains too much text and hardly any pictures, one has already lost with such a website nowadays. Users are almost addicted to fast visual content that they can open on their smartphone at any time without having to wait for long loading times. The technology, which hardly anyone knows today, but which can implement exactly what the users of the future will demand in the coming years, is the progressive web app. 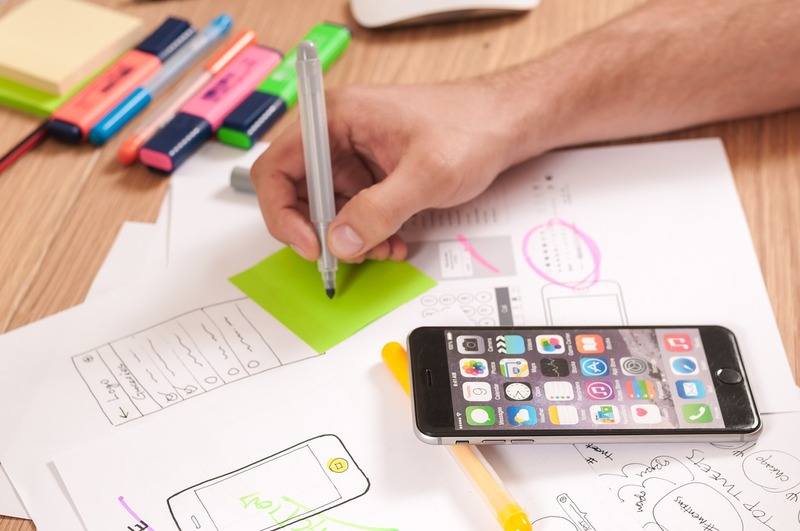 State-of-the-art software from progressive companies enables even small businesses to develop their own pwa for very little money in the shortest possible time. Without an expensive software developer and without any knowledge in programming. 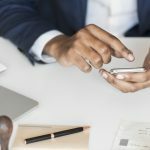 Progressive tech companies have already set themselves the task of making it possible for even the smallest companies to communicate with their customers through an app. pwa-builder.io specializes in creating progressive web apps for small and medium businesses in India with a DIY kit. The focus was on the Indian market, as there is very great potential here, which will be further expanded in the coming years. As a small company, this step towards new technologies already gives you a valuable advantage over your competitors without great financial expenditure, as you can manage your customers with state-of-the-art technology. Companies that have already upgraded to a progressive web application have achieved the best results. With a progressive web app, Trivago achieved a significantly higher conversion rate than with its native app. The click rate on hotel bookings increased by 97%. The conversion rate has improved significantly, which is due to the fact that the pwa is much easier to achieve for users. 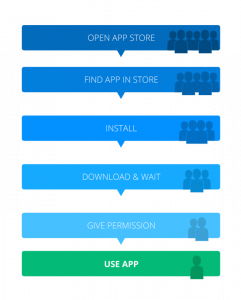 A native app must first be downloaded from the Appstore and then takes up a large part of the memory. This takes a lot of time in today’s always faster getting world and is less and less accepted by users these days. require only one click, just open the URL, which you can then use immediately. 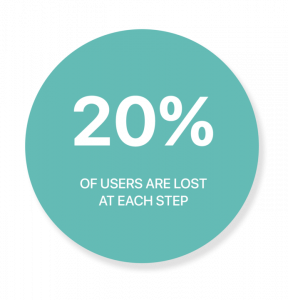 That “20% of users are lost with every step on the way to the download” gives you an impression of how outdated the technology of the native app is compared to the progressive web app. Directly after opening the progressive web app the user reaches the complete unfiltered content of your app. After a short time a banner appears asking the user if he wants to accept push messages from the app. A moment later, a second banner appears, with confirmation of which the pwa is added to the home screen with a click. The progressive web app can now be seen on the smartphone’s home screen and looks exactly like a conventional native app from the appstore thanks to the icon. Even if the pwa is opened, it looks and feels like a native app. Nevertheless, it is a PWA that is always up to date and can also be used offline due to its storage in cache. Companies that already recognize this trend can communicate easily and quickly with their customers, send them push messages and inform them about current company news. The app takes over the booking of appointments for previously necessary telephone calls. The progressive web app can be managed on the go and created and modified according to your own wishes. What normally costs tens of thousands of dollars is now possible for every small company, so small business owners can now book a package for only 1 dollar and publish their own first app. The technology will continue to develop over the next few years so that it can always be kept up to date. Those who recognize the benefits of a progressive web app for their own business already now will save all their competitors valuable time, which gives them an important head start. If you have the chance to take your company to the next level for less than $15 a year, I can only advise you to do so.